PSX Castlevania: Symphony of the Night (USA) "Richter mode" in 05:39.85 by pirate_sephiroth & ForgoneMoose. Castlevania: Symphony of the Night is the first installment of the Castlevania series on PSX, and was also the very first PSX game to have a published TAS. 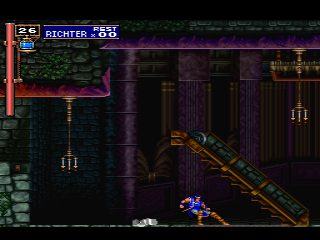 Follow Richter (playable after you beat the game once) as he glitches and speeds through the castle on a quest to defeat Dracula. If you like fast sliding, dashing, uppercutting, and using precipitation to defeat bosses, you'll love this run. This is an improvement of 1.90 over the previous run. You can read the author's comments for more information. TASVideos also has several runs using Alucard, including a Replay run, a run that aims for fastest time on a clean save, and a run that kills every boss and obtains all relics. We also have a run from the Saturn version using Maria.